Raven, Crayfish and Horse are three close friends. They are moving into the next phase of their lives, and want to build families of their own, while maintaining their close relationship. They decide to design a house that can accommodate their singular needs. This is no easy task as Raven lives high in trees, Crayfish deep in water, and Horse needs grassy areas. How is it possible to live together when their needs are so different? This story is about friendship, growing up, and change. The players are quirky characters who present strong messages. These filter through a deceptively simple story that reflects on how opposites attract, and how the strangest people can become the best of friends. It is also about problem-solving and compromise; how a complex issue can be resolved with discussion, especially when all parties offer their point of view. It’s a perfect example for children (and adults) when difference of opinion is an issue. 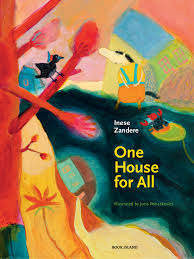 One House for All is another excellent translation from Latvia with Book Island’s usual impressive high quality production and presentation. Juris Petraskevics’ lavish illustrations are created using contrasts of dark and vivid colours that fill the pages with mystery through shadow and light.